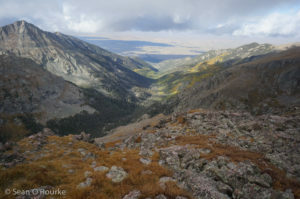 With some early-season snow forecast for the San Juans, I headed east to the drier and warmer Sangre de Cristos slightly earlier than expected. The unsettled forecast led me to make less-than-ambitious plans, including this pair of 13ers just south of the Crestone 14ers. Though I did not get rained or snowed on, this short outing felt about right for a cold and, up high, bitterly windy day. I had run part of the Cottonwood Creek approach this spring, but had not seen the upper canyon. 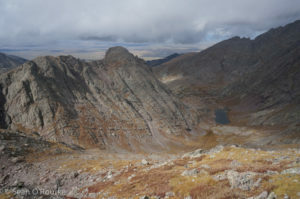 Unlike the neighboring Willow Creek trail, which sees a good deal of stock and 14er-bagger traffic, and is therefore wide and graded for wheelchairs, this trail is not passable by horses, and sees little human traffic. As a more difficult alternate approach to the Crestones, and to a few obscure lesser peaks, it sees enough traffic to maintain the cairns and keep the willows mostly at bay, but is faint and blocked by a number of minor blow-downs. It is also blessedly direct, climbing straight up the valley from 8400′ to where the stream splits near Crestolita’s west ridge at 11,000′. 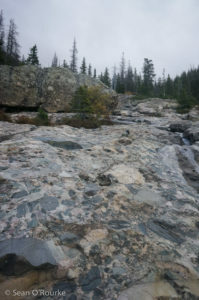 I passed a tent on the way up, then continued through open woods and across some interestingly polished conglomerate slabs. At the fork in the stream, the only extant trail turns left, looping back as the stream is channeled back west through a cleft in the rock. The trail becomes increasingly faint as it climbs steeply through talus and willows toward Cottonwood Lake. I left it near the second cascade, making my way for a grassy ledge that cuts back south to gain Crestolita’s west ridge above its cliffy toe. Once on the ridge, I made my way up easy grass and sheep-trails toward Crestolita’s twin summit, looking behind me to see what sort of clouds were coming. 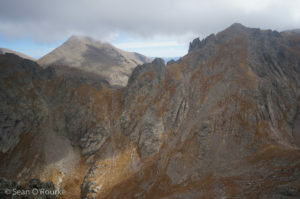 Crestone Peak’s and Needle’s summits remained just hidden to the north, as did the tops of Music and Pico Aislado to the southeast. I had a mostly pleasant climb, shielded from the wind until nearly the top. Once on the summit, I pulled the usual pile of wet paper from the PVC register canister, then hid in the peak’s lee to put on all my clothes and read what I could. Broken Hand is close, but watching the wind whip over the ridge between it and Crestone Needle, it took me a few minutes to summon the motivation to replace the wet paper and reemerge from my sheltered spot. I had thought to simply traverse to the saddle east of Crestolita, but doing so would keep me in the wind, so I instead dropped down a loose gully on the north face, then contoured out onto grassy ledges to its east. 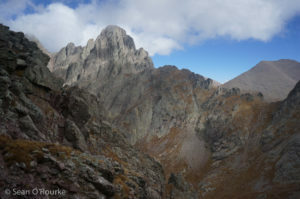 After a descending traverse to the saddle, I realized I had been lucky: while I had seen a few cairns and nothing harder than class 3 on my route, Crestolita’s northeast ridge looked steep and tricky, and would have been no fun to downclimb in gloves. From the saddle, it was more easy grass to Broken Hand, where I appreciated the summit for all of 10 seconds, then descended before my eyeballs froze. 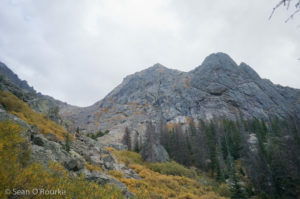 Being part of a standard 14er route, the west side of Broken Hand Pass featured a CFI-installed trail that extended to the base of the red gully on Crestone Peak (which does not yet have a hand-line). Below that point, the trail back down Cottonwood Creek is somewhere between faint and nonexistent. After a bit of struggle following game trails through willows, I picked up the route I had used on the way up, and was on my way home. The tent was still there as I jogged by, and I smelled a campfire, but I neither saw nor heard the occupants; I’m not sure how they were spending their cold, wet weekend.